Basic Chinese Characters contains 2500 commonly used Chinese characters selected by the Ministry of Education of China. The book sorts the characters by frequency usage according to Google's estimate of occurrences on the Internet (details). A learner may choose a certain point in the book suitable to his level and start to learn the characters. The book is ideal for learning Chinese characters in a casual way and on a cell phone. Notes Abbreviations, notes on pinyin, character frequency, definitions, etc. The Chinese characters may appear in suboptimal font when viewed in Kindle for PC. The problem does not exist when viewed on a cell phone or in Kindle Cloud Reader. Please contact me by email to yong321@yahoo.com or by filling the form with comments or corrections. Why are the characters not ordered by pinyin or number of strokes? 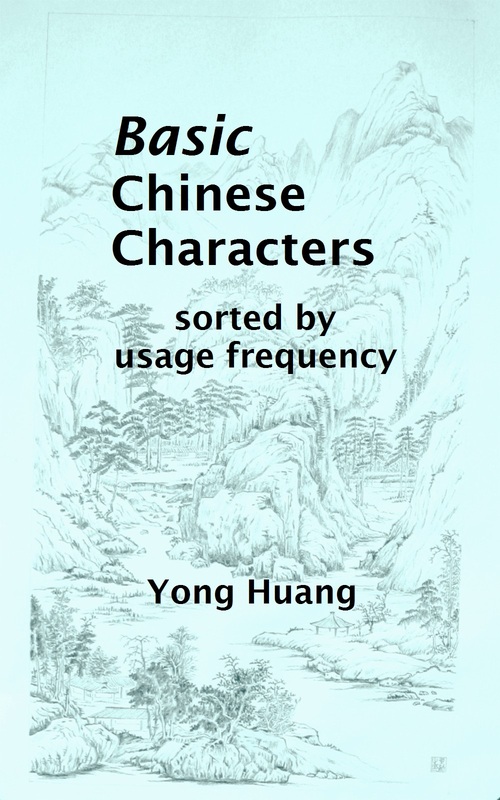 Since the book is not strictly a dictionary and is meant to be a study material, I thought ordering the characters by usage frequency would make more sense so the reader can go to a section matching his level and start to read. Any suggestion on efficiently learning Chinese characters? I have no reservation in recommending two books whose authors I have no connection with. Alison Matthews, Laurence Matthews, Tuttle Learning Chinese Characters, and Rick Harbaugh, Chinese Characters: A Genealogy and Dictionary. An adult learning a foreign language vocabulary, and characters in case of Chinese, must, to some extent, rely on mnemonics and/or etymology. These two books are the best I know in offering these two pieces of information to an English-speaking person. The rest of the study is the same for a learner of any age, i.e., repeated drills. And the more the better. In this regard, my book, which is easy to load in a cell phone to be reviewed at any short moment, maximizes the occurrences of these drills. What's the background picture on the cover of the book? That's my hand-copying (lin2mo2,línmó) of the Qing dynasty painter Huang Ding's Shan Shui Tu (Picture of Mountains and Water). I have a full page dedicated to this painting with some other comments.